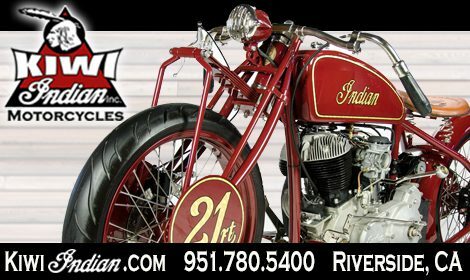 The VM series Mikuni Carburetor’s are a popular performance addition for many 2-cylinder and 4-cylinder vintage applications. They also work very well, as a dual carburetor set up for Harley-Davidson. There are many jetting and tuning options with these carburetors, which is why they are so popular. For this month’s tech I am going to cover the procedure of synchronizing the carburetors to your engine. 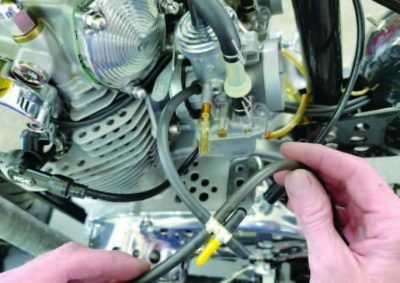 The installation of the carburetors and throttle cables is very straight forward. In this tech I am going to show you how I set up a 2-carburetor system. 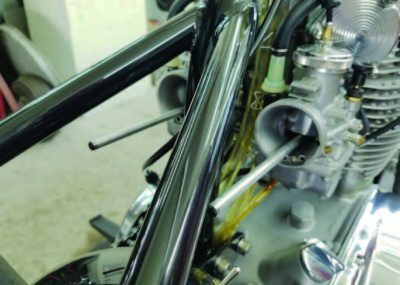 With the carburetors and cables installed you can start the adjusting process. 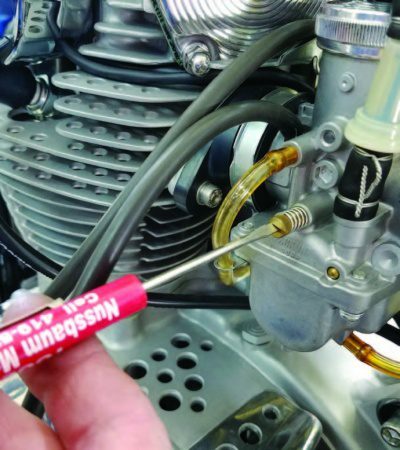 Start by grabbing the throttle and opening it wide open with one hand, use your other hand and stick you finger on the bottom of the carburetor slide and push up. 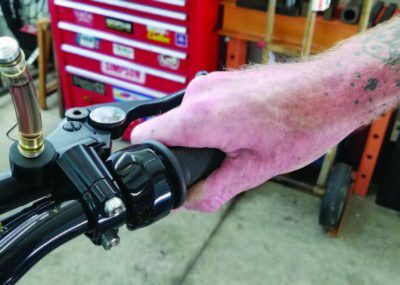 If there is any upward movement with the slide when the throttle wide open, you are not achieving full throttle and will need to adjust the throttle cable. Adjusting the slack out of the throttle cable is pretty straightforward. 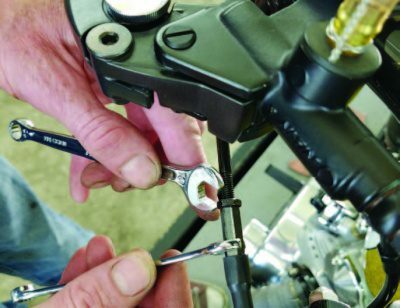 Making the adjuster longer, makes the cable shorter which takes up the slack at the carburetor slide. 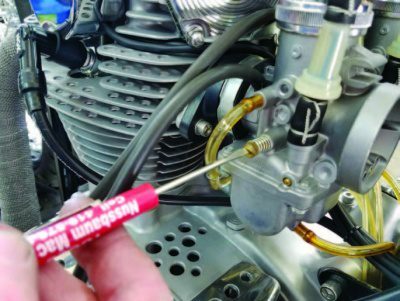 In some instances you will not be able to get all of the slack out of the throttle cable adjuster, at which point you will have to go to the adjuster on top of the carburetor to remove the remaining slack. With the throttle wide open, check to make sure that your slides are all the way to the top. This allows you to achieve wide open throttle. Now, we want the carburetor slides to move at the same time. This is what I call bench synchronizing. I use two 1/4” diameter 6” long round pieces of aluminum, I use these as my “slide sticks”. I slightly raise the carburetor slide then insert the stick in between the carburetor body and slide. Then let the weight of the slide hold the stick. I do this to both carburetors. Now you can slightly move the hand throttle and watch the sticks move. What your trying accomplish here is to make both sticks move at the same time. 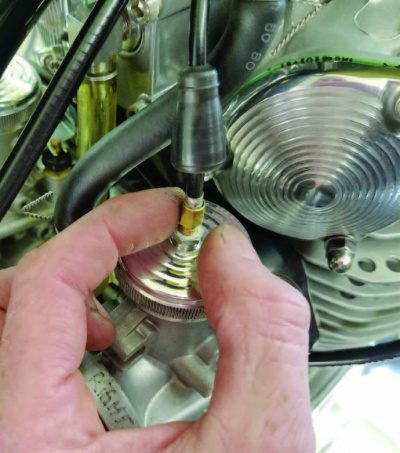 There is a cable adjustment on top of the carburetor, by adjusting this in or out you can achieve equal stick movement. With the slides now moving the same we need to get a ball park adjustment on our idle screws. A good place to start with this is to turn the idle screws all the way until they stop, then back them out 5 or 6 turns. The should make the bike idle when you start it. The air fuel mixture screws are directly below the fuel inlet. I typically start with these 1 ½ turns from seat. In, being richer and out being leaner, yes… they are backwards from most carburetors. For the next step, we are going to be using a Motion Pro Synchronization gauge. This is a great tool to have and costs less than $100. What makes the Motion Pro gauge superior to others on the market is the fact that you can calibrate it! To get things started remove the vacuum cap from the carburetor body. Just ONE side. 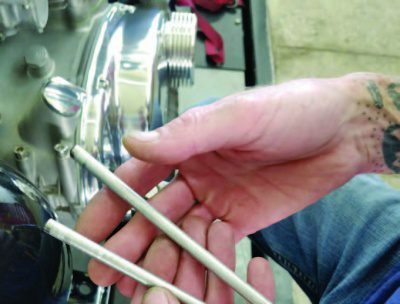 Next, install the short piece of hose with the splitter, then run 2 hoses from the splitter, one to each gauge column. 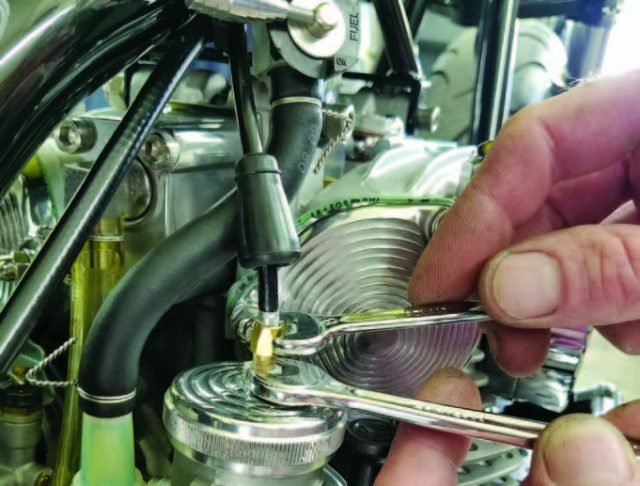 There are two steps to synchronizing the VM style carburetor with a gauge. The first step is to synchronize the idle. Second, you synchronize at part throttle. 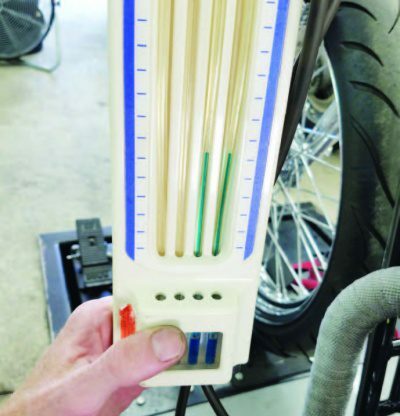 Once you start the bike up, typically the columns on the gauge are not matched. 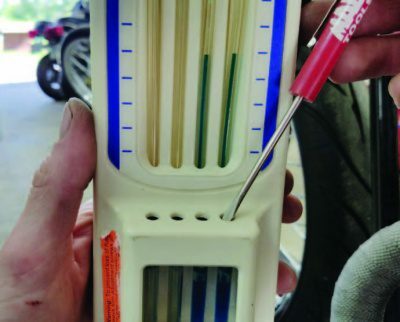 Adjust the idle on one carburetor to make the columns exactly the same. 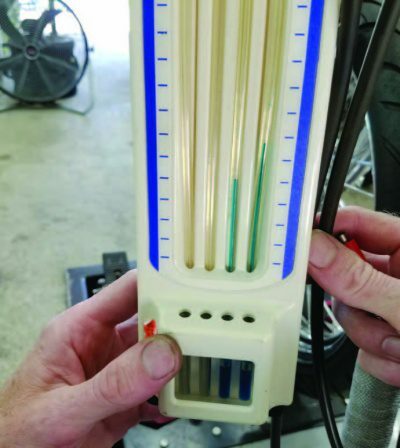 You may have to jump back and forth from carburetor to carburetor to get the correct engine idle speed that you are after. 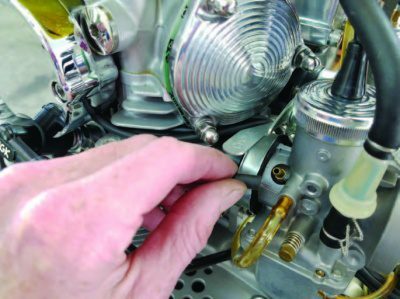 The second step of synchronizing the carburetors is at partial throttle. I typically shoot from the hip here and do a high idle rev, something below 2000 RPM. This can be tricky to do by yourself… But, I do so you can too! The adjustment on top of the carburetor (brass piece) is what we are going to be adjusting while the engine is running at high idle. 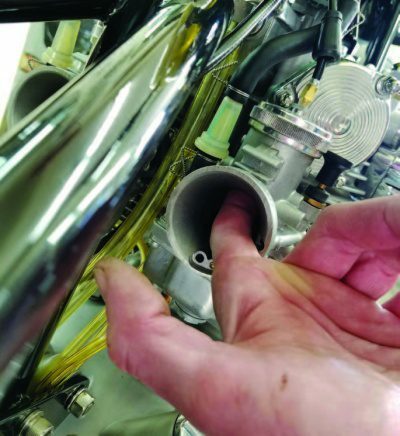 With one hand achieve high idle with your throttle, the other hand will be on the adjuster (brass piece) on top of the carb, all the while watching the columns on your gauge, you will turn the adjuster up or down to make the columns match. This WILL take a few times to get this right, because when you lock down the jam nut it will change the columns. To address this I loosen the jam nut, rotate the adjuster half of a flat then lock it back down. Now check your gauge at high idle. It is either on the money or way off again. If way off, go back to your starting point, move it half a flat in the other direction. Also, don’t forget to pay attention to the temperature of your bike. You don’t want it to get to hot. 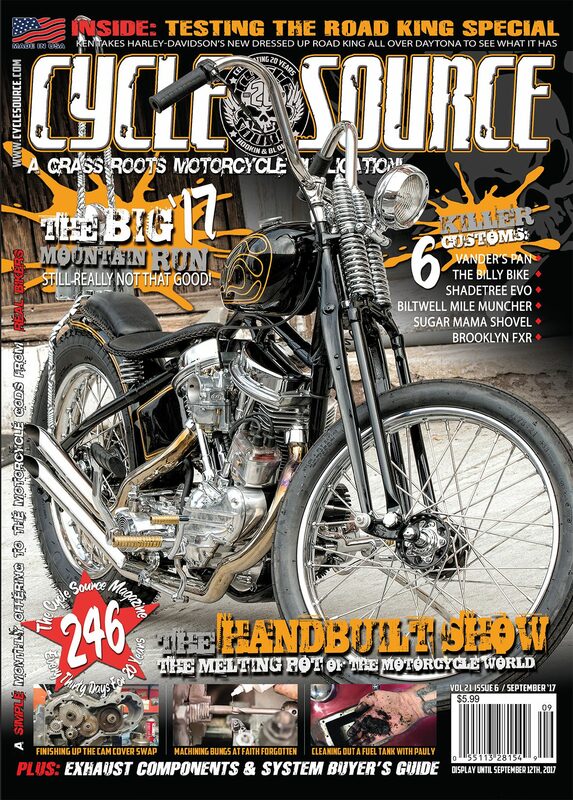 This entry was posted in Tech Tips/ DIY and tagged Back Issue, Cycle Source, Cycle Source Magazine, Daniel Donley, Mikuni, Mikuni VM Series, N'SYNC, Pandemonium Custom Choppers, September 2018, Tech, Tech Article, Tech Tips. Bookmark the permalink.